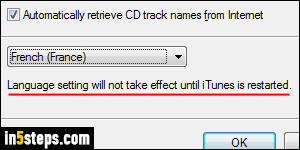 When you download and install iTunes, it will automatically be configured to use your operating system's default language (your Windows country settings, for a PC). If you go to a different country's iTunes download page on the Apple website, you might get a copy of iTunes for a different language. But you don't need to do that, because iTunes lets you change its interface language from the program's preferences, regardless of your computer's regional settings! To change iTunes' language: on Mac OS X, click on the iTunes menu (top left corner of the screen), and select Preferences. 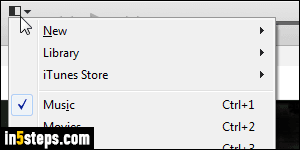 On Windows 7 / 8 / 10: if you enabled the classic menus in iTunes, go to Edit > Preferences. 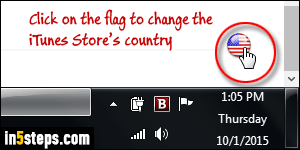 Otherwise, click on the menu icon (top left corner) and pick "Preferences". You can also use the Ctrl+, keyboard shortcut on Windows, and Cmd+, on a Mac! Make sure that the General tab is selected at the top. The current language and country are shown in the Language dropdown at the bottom. When a language is listed multiple times, the country shown in parentheses indicates what dialect and regionalisms will be used. iTunes currently supports 35 languages and variants (Traditional Chinese vs. Simplified, Traditional Spanish (Spain/Castilian) vs. Mexico, etc.) Pick a different language and click OK.
Once you've made a change, you'll see the "Language setting will not takes effect until iTunes is restarted" message. First, exit iTunes; then, wait 10 to 15 seconds: I once lost my entire music library, ratings, custom genres (etc.) and had to rescan everything and start over, because I restarted iTunes too soon. Although iTunes' window was gone, it was (apparently) still in the middle of saving changes to my library when I restarted it. So it's worth waiting a bit! 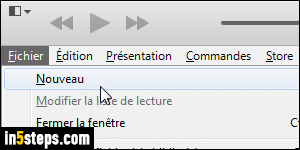 Once iTunes restarts, all menus and commands are displayed in the language you chose. But the iTunes Store will still use your original language and be tied to the same country. That's because the iTunes Store is actually not part of iTunes: it's a website, like Amazon. The only way to change the iTunes Store language is to switch to a different country's store in the bottom right corner of any page (see screenshot). But you won't be able to buy anything from a foreign country's store unless you have a credit card from that country!